I decided I didn’t want to write vegetable recipes. So I didn’t. Instead, I’ve been working on the online layout of the Ryan Family Cookbook. I’ve broken the Soups, Salads, and Sides section down. Same thing for Desserts. That way it will be easier to find exactly what you want. I’ve also added some soup recipes. And a cake recipe along with another candy recipe. One of the soups is very appropriate as we’ve all been thinking about Phyllis Quesnel lately. It was a recipe from Aunt Phyll. I remember eating it at her house on a number of occasions. It’s a great soup for when the crowd gets bigger and bigger as it gets closer to time to eat. You can just keep adding veggies and ham! Jeff likes this soup. A lot! I do, too. From a Post Bariatric Surgery Food Plan perspective, it’s a good choice, lots of protein and lots of veggies. You can easily limit the carbohydrate content by using fewer potatoes and mashing them before you add the other ingredients. And choose frozen vegetables that are not heavy on corn. The cake recipe I added was not in the original Cookbook. But it’s my “go to” dessert these days when I really need to have something special. Again, a bit more Post Bariatric Friendly. I’m still waiting to hear from some of the people who didn’t have a chance to contribute recipes way back we did this project. Now’s your chance to let everyone know what your favorite family recipes are! Use the contact button to send it. I’ll type it into the site as soon as I get it. Promise! What do you think of the photo? 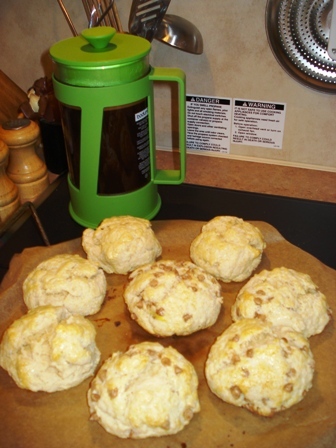 These are scones that I make fairly regularly. Even in my tiny little travel trailer oven. Want the recipe sooner rather than later? Leave a comment and I’ll add it ASAP! Is there a section of the Cookbook you’d rather have added here first, like main courses, cookies, appetizers, etc?